The Chinese might be on to something here. 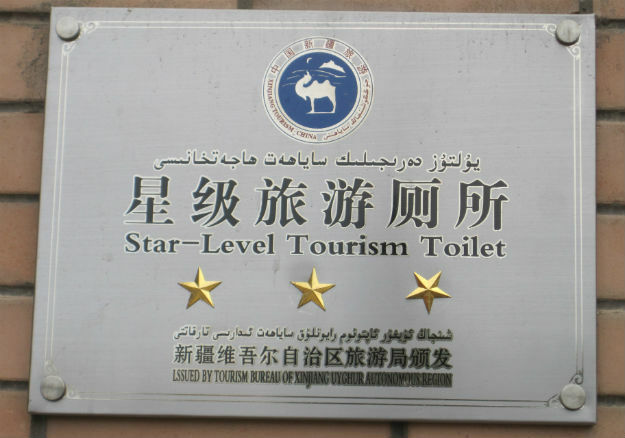 Shouldn’t all public toilets be ranked? This is my Uyghur cold noodle restaurant. The “chef” let me video him in his hyper splendor. I love this guy. If you can’t see the video below, the link is here. It’s not blurry like this image suggests! A noodle dish like this is about 5 yuan, or 85 US cents. This is my fourth time in China, but two of those were short trips to Guangzhou, so I don’t know the country well. Far western China is hardly China, anyway—for now. Ethnically, this province, Xinjiang, if I’m not mistaken, used to be almost 90% non-Chinese, but with a government push to dilute that, a la Tibet, I read that now non-Chinese make up less than half of the province. When crossing from Kyrgyzstan into China, clocks are set ahead two hours. All of China is in the same time zone, which makes for weird official sunrise and sunset times; northern Xinjiang must have midnight sun on the solstice. However, in a clever form of rebellion against Chinese rule, locals go by “Urumqi time”, Urumqi being the capital of the province. Everything government-run such as post offices and trains are on Beijing time, while nearly everything else is on Urumqi time, two hours earlier. Yeah, I used to have a XMQ6532CEG4C, but now I drive an V!G4$@49#*JE. 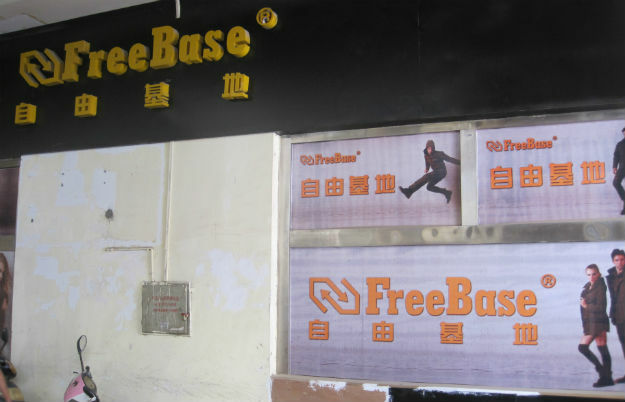 I get a charge out of hearing Chinese people tell me their easier-to-remember western name. Sometimes the name matches their personality: quiet, bookish girls are Janes and Marys, then come the Angelinas and Tiffanys, but why not go all way and choose a cool ethnic name? What about Tyrone? Joaquin? If I ever meet a Chinese Tyrone we will be best friends forever, and if I ever meet a Chinese Moesha I will go down on one knee and propose on the spot. I expected to see a million motorbikes in Kashgar, but I was surprised to hear almost no engine noise—they’re all electric. Impressive. Now they just need to invent a quiet horn. The noise can be brutal. I thought I was at Grandmaster status in crossing chaotic city streets all over the world, but China has humbled me. The police are sometimes directing traffic and there are plenty of timed stoplights, but it’s all anarchy in disguise. There is also a young Polish traveler who has hitchhiked from home to here. He had amazing stories of spending minuscule amounts of money and receiving endless hospitality by everyone he came in contact with, but something about him rubbed me the wrong way, as it seemed like he was manipulating everyone for food, transport and shelter. The line isn’t so fine between accepting offers and getting people to do stuff for you. He said in Iran that he would hitchhike when he got hungry and when he needed a place to sleep. Iran’s hospitality is legendary, but still, at some point they are going to feel used. He said his goal was to spend $136 in one month in China and he will become what I call a scorched earth traveler to achieve it. I’m glad he isn’t going to Japan or he’d really see how easy it is to roll over people into helping the “hapless” tourist. Preparing some soup at the Sunday livestock market on the edge of town. The man is collecting wool under some uncomfortable sheep. Nothing is wasted in China. Mao and me. I don’t recognize myself in shoes, but in a rare moment of wisdom, I wore them at the livestock market. “All of it shows fully…” This is from a description of the main mosque in the middle of town. I love when the heavy-handed government tries to show how benevolent they are. 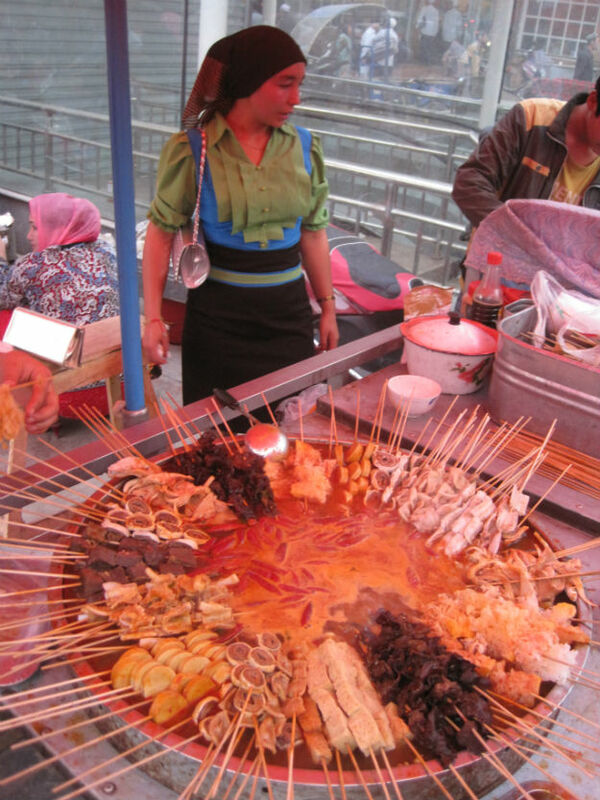 Kashgar night market food. It’s been very handy to know some Turkish, especially for the numbers, which are almost the same, and food. It’s fun, for example, to see that “nokut” is the word for chickpea here and then remember that it is “nohut” in Turkish. 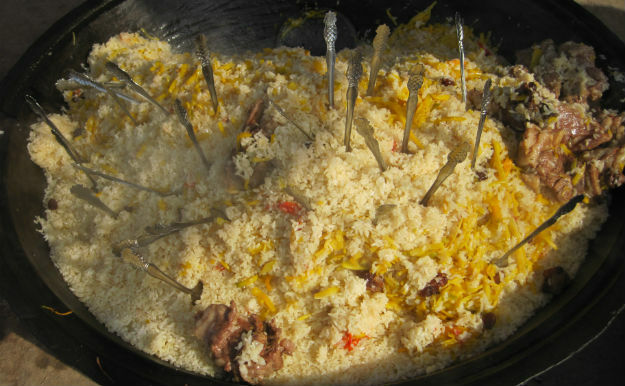 Turkey is far, but culturally, it feels near. 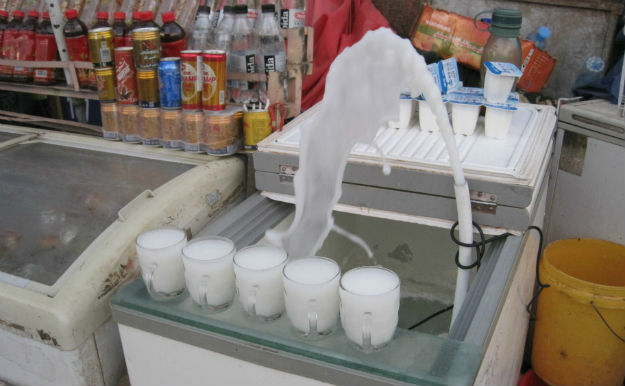 A fountain of white drink, probably something related to kefir. 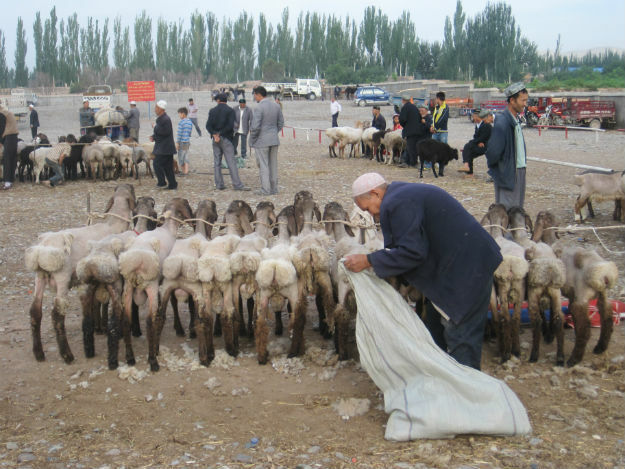 Even though I spent 12 long days in Kashgar–three or four of them sick in bed—if you take away the people, it isn’t an intrinsically interesting place. The old town is hemmed in on all sides by high-rise “modern” China, making the old town feel like Uyghurland, a tourist district. This is a renovated old town street. A Chinese guy in my dorm room who calls himself Neil (Neill? Neal?) pointed out that the government spent seven billion yuan (over a billion US dollars) to renovate Kashgar, but it has become soulless, which makes it money well spent in the government’s eyes, I guess. 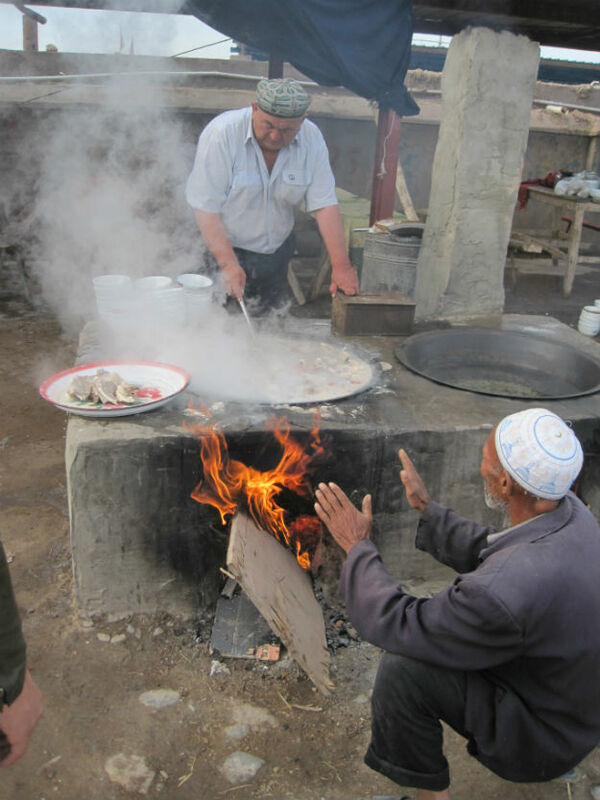 The special thing about Kashgar—for me, the only thing—are the people. Kashgar is world class people watching. Even better is when you can find people who speak English, though sometimes a common language isn’t needed. I sat with an ethnic Kazakh who communicated with me via his iPad. We wrote messages and passed it back and forth to be translated. He asked me if I knew about the Chinese cultural invasion and what my impressions were. One guy at a shop down the street from my hostel always bounds out of his chair when he sees me to shake my hand. Once he rushed over to a desk and pulled out a book. It was in Uyghur—before I came I didn’t know the language was written in Arabic script—and, beaming, he proudly said that he was reading “Hamlet” by “William”, as he put it. I wasn’t expecting to see such a variety in the way women dress, particularly the bright colors and designs. Some cover themselves completely, showing only dark henna stains on their fingertips and with a thick garment over the face that they have to hold close so they can see through it, but at the same time they’ll have shiny, eye-catching rhinestone-like designs on the sleeves and I saw one such woman wear purple and white pumps. My favorite look was from the 60s: big bouffant hair in a scarf, huge Jackie O sunglasses, mid-length skirt, nearly running me over in a scooter. Let me know when you become a millionaire, Flavio! I agree with Flavio. Great post. I wish all blogs were like this, with lots of images and a few interesting observations in between, rather than the vast majority of bloggers who either spend 3000 words describing every minute detail or use their blog as a testing ground for the novel they hope one day to write. 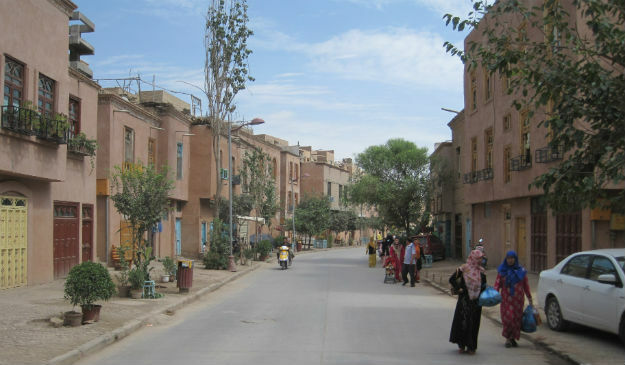 Can’t believe how sanitised that Kashgar street looks; so tragic that the old city is becoming a kind of tourist theme park while the remainder of town looks like any European or US suburb! Where to next for you guys? Thanks for your comments! I hope you will stay with me. I just arrived in Japan and I don’t know where Flavio is, but he has been given the assignment to tell everyone he has ever met about my blog, including all potential millionaires. Of course we’ll stay with you. You’re our favorite planet-wanderer! Thanks! Expect a grumpy post next. Love it! 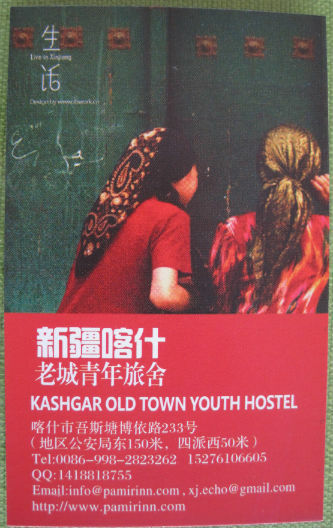 I was saddened by Kashgar last summer, having been there in 1998. Plus the Chinese government was in the midst of infuriating me repeatedly. After 7 trips to China, I think it may be a long, long time before I’m back. (But you never know!) Did you know that every city in Guangzhou province has been twinned with a city in Xinjiang? They’re supposed to send a large quota of settlers to their twin city in the great Han-ization of the Wild West. Thanks, Lena, what do you agree with? Graydon, I didn’t know that. Who knew the whole sister city relationship premise can be so used as a tool for ethnic cleansing, if I may be so dramatic? It’s been a while since we last met in Chiangmai. 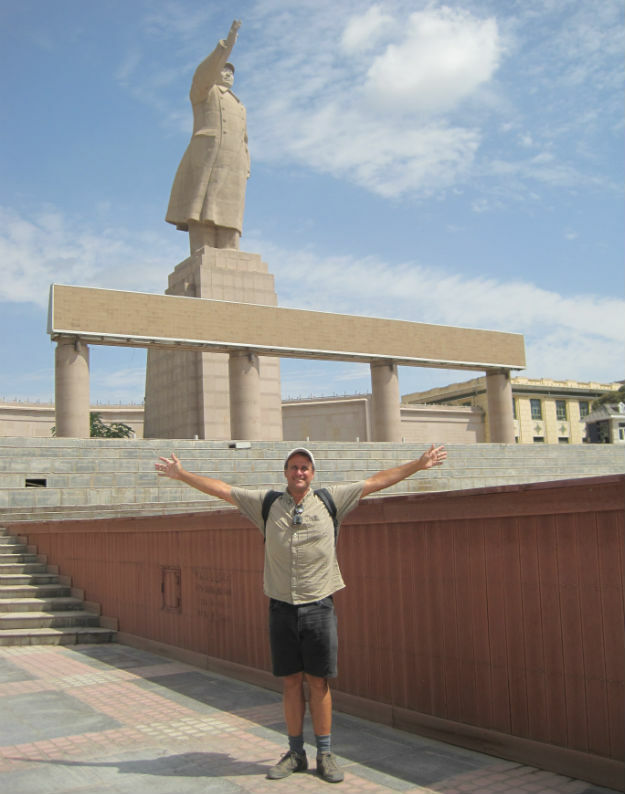 It’s interesting to read your China blog (although I haven’t really finished them). But I just couldn’t help sending you a message to ask this, when will you be in Kuala Lumpur, Malaysia? So that we can meet up. I am in Japan and I want to see a dentist about my broken tooth, but I thought of Malaysia, too, if I need to see a dentist. We’ll see. It would be great to meet. I saw a photo of your little girl. She is adorable!